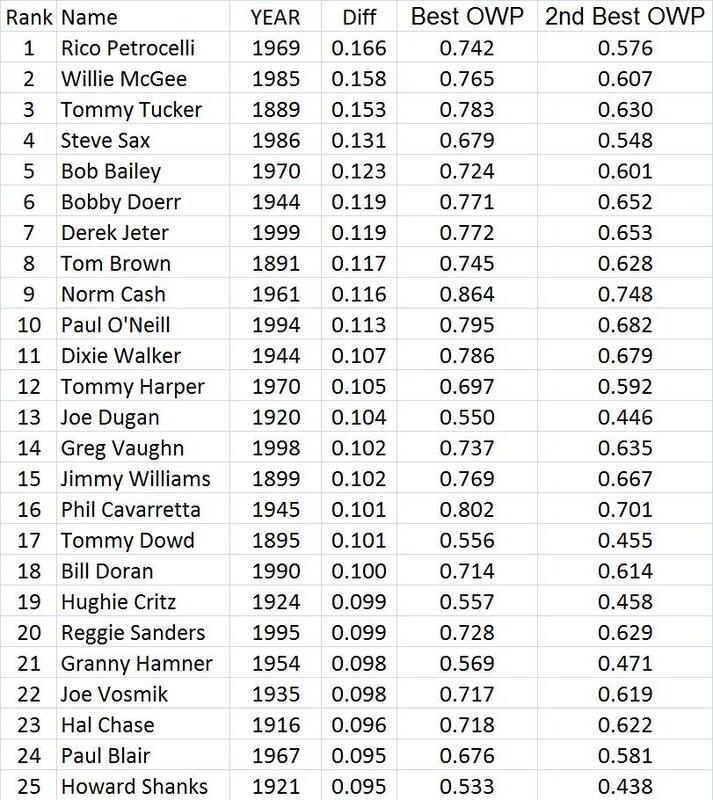 One idea I have about the Hall of Fame is that worthy players should have at least some significant peak value. Maybe something like 3 straight MVP caliber years. 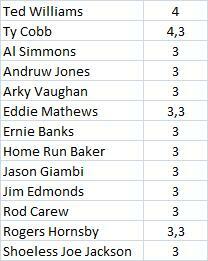 Baseball Reference suggests that a WAR of 8 or higher is an MVP type season. So I lowered it just a bit to 7. This would actually make for a very restrictive Hall. I found only 36 players in this group. They are listed below. 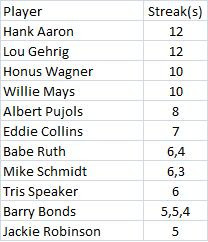 The co-leaders are Henry Louis Aaron and Henry Louis Gehrig. Their two streaks were exactly 30 years apart. Gehrig's was 1926-37 and Aaron's was 1956-67. Some great players did not make it, including Frank Robinson and George Brett (who are definitely Hall of Famers, probably in anyone's book). Ron Santo had 4 straight years, 1964-67. Jackie Robinson had 5 straight from 1949-53. That is incredible. Andruw Jones and Jim Edmonds are two of the more interesting surprises. 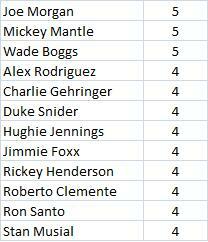 Part 1 was actually Which Players Had The Most Uncharacteristically Good Seasons? 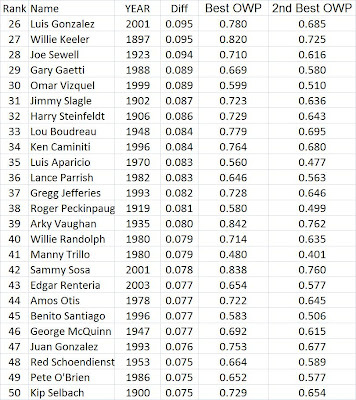 What I did there was to find all the players who had 10+ seasons of 400+ PAs and then see who had the biggest difference between their average (offensive winning percentage) OWP and their highest. Here I simply looked at their best OWP vs. their 2nd best. 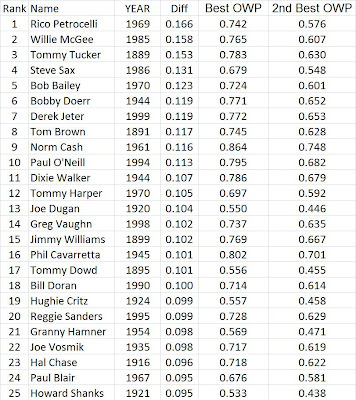 Jeter actually had .715 in 2006. That would drop him down to about 87th place out of about 500 guys. So there could be some other big ones since then but I will need to look into that. 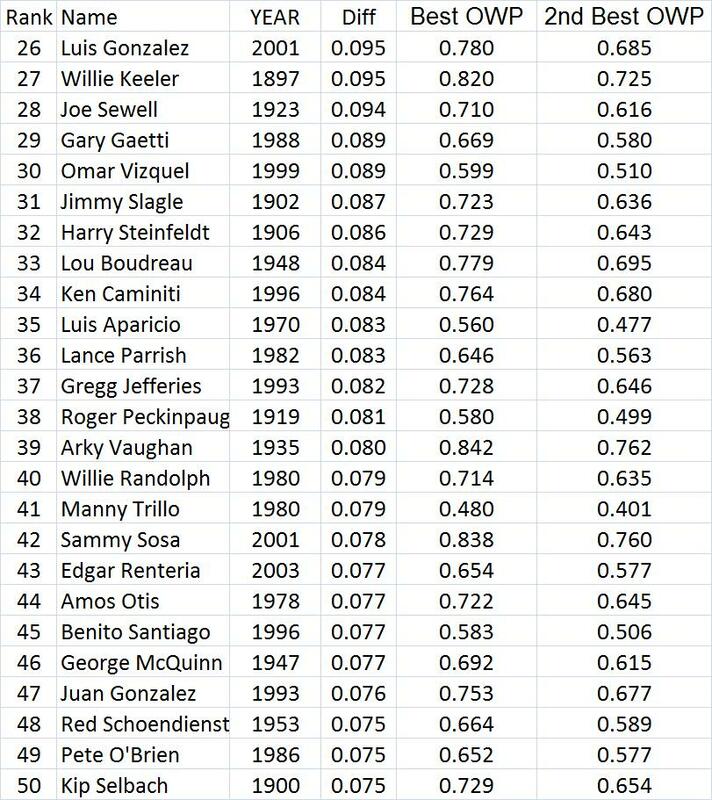 I also looked at this including everyone with 3+ seasons of 400+ PAs. I will post that if I get a chance or you can email me about it.